The Oxford University Press presents H.P. 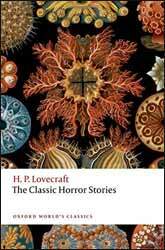 Lovecraft: The Classic Horror Stories, as part of Oxford World’s Classics. This is a good quality heavy paperback book incorporating nine long stories surrounding the Cthulhu Mythos – along with additional notes and other information on the author, edited by Roger Luckhurst, an expert on Classic and Gothic Literature who (rather ironically) teaches modern literature at Birbeck College, University of London. I must confess to being a huge fan of Howard Phillips Lovecraft’s literature; in fact, he is one of my all-time favourite writers of fiction. I positively enjoy the formal style of retrospective storytelling that was prevalent in the late 1800s and early 1900s. Lovecraft was an often unsung master wordsmith with very much his own individual style, which he himself termed ‘Weird Fiction’. Many examples were published in Weird Tales and other pulp magazines of the time. Considering he was only 47 when he died and had a difficult childhood (his mother having been committed to a sanatorium), his output was both prolific and classic. These were the types of stories never seen before. He created his own mythos of the Old Ones, intelligent creatures from before the dawn of man, some of which are considered great and powerful gods in the context of the stories. They exist still, accessed via strange dreams, other dimensional realities – or simply beyond the easy reach of man. What makes these stories work so well, even now, is that the inherent beings or aliens are kept in the proverbial shadows for much of the time, making their presence that much more chilling. These are not Hollywood-type monster/extra-terrestrial rampages across the earth. The majority of Lovecraft’s tales are effectively one man’s experiences of wonder, horror and quite often jibbering madness, too. The characters see such bizarre sights which terrify them beyond reasoning that they find it almost impossible to relate to them. It’s things which really shouldn’t happen in this life, and descriptions are cleverly kept to the bare minimum so that the imagination builds them up to the appropriate level. Unlike Edgar Allan Poe (another timeless writer), Lovecraft material is notoriously difficult to portray on film for this very reason. There are less than a handful of semi-successful achievements; I don’t include (Herbert West) Re-Animator among them, as some might. For around twice the price of this book you can purchase a beautiful leather bound complete works of Lovecraft. I have one myself which I cherish. But perhaps that is for the future. I owned several shorter collections before deciding on the large tome. So, I would encourage any newcomer to these tales to dip their toes in the water with this book. It doesn’t cover the diversity of situations that he explored as a writer, but rather concentrates on the Cthulhu Mythos of the Old Ones. But believe me, there is plenty to enjoy here. The stories are as follows: The Horror at Red Hook, The Call of Cthulhu, The Colour out of Space (a favourite of mine), The Dunwich Horror, The Whisperer in Darkness, At the Mountains of Madness (more of a novella than short story), The Dreams in the Witch-House, The Shadow over Innsmouth, and The Shadow out of Time (another favourite). Read them slowly, let them seep into your consciousness. You won’t regret it. In addition to the stories themselves there is an Introduction, Note on Text, Select Bibliography (books about Lovecraft, rather than by him), a Chronology of H.P. Lovecraft, and Explanatory Notes. The Notes are good insofar as they tell you a little about Lovecraft’s writing and early sporadic success, but don’t get bogged down in the references to every name and place and culture. Ignore these and enjoy the stories.